Authentic lineage. Profound teachings. A warm, dedicated community. Welcome to Orgyen Khamdroling where, under the excellent and spirited guidance of Anyen Rinpoche, we are committed to furthering genuine dharma practice in the West. 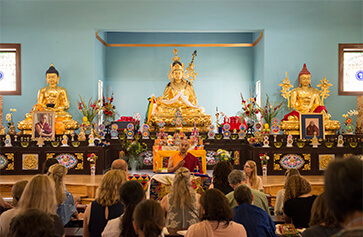 Whether you are a seasoned Buddhist practitioner or simply curious about meditation and what these teachings have to offer, we invite you to drop in to an weekly practice session, come to a public teaching by Rinpoche, or sign up for a more intensive program. With an excellent command of English, Anyen Rinpoche transmits the wisdom of his lineage with immediacy, rigor, humor and penetrating insight. 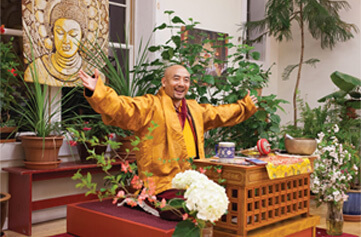 He is a heart son of Tsara Dharmakirti Rinpoche, and fifth in an unbroken lineage of heart sons who received an uncommonly short, unbroken lineage of the Longchen Nyingthig and the Dzogchen teachings directly from the renowned siddha Patrul Rinpoche. Have happiness and the cause of happiness! Be free of suffering and the cause of suffering!